Each reference details the structure of a single SharePoint item (portal, area, site, etc. )—it lists the fields from which CES must extract information. New references must be added for each custom template used and, if an existing template is modified, its corresponding reference must be updated as well; otherwise, erroneous or blank results are returned by queries (ex. : the content and summary can be blank and the author name missing). In order to index additional information (ex. : language) a custom field must be created in the Custom Fields page—each custom field is displayed in the reference page below the Properties section. Note: SharePoint references are used only to index structured information. Unstructured information is automatically extracted using the corresponding converter or IFilter. 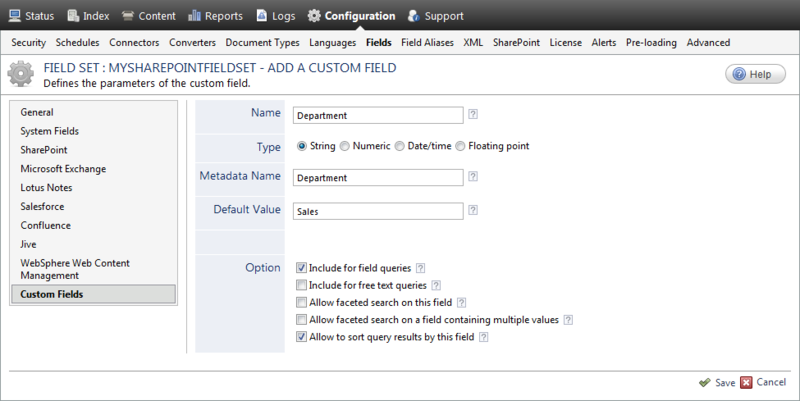 In the Field Sets page, click a field set. In the Custom Fields page, click Add. In the Name box, enter a name to identify the field. In the Type section, select the appropriate field type (see Adding or Modifying Custom Fields). In the Metadata Name box, enter any non-empty value (the actual metadata name is entered in the reference page in the form %[metadataname]). In the Default Value box, enter the field type (ex. : string). The default value is indexed when a field is empty. 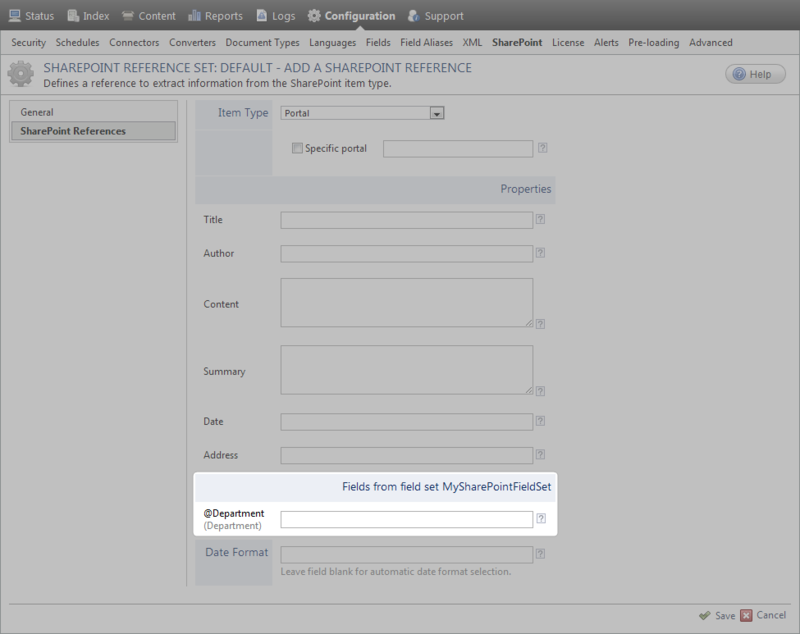 Note: If the field applies only to SharePoint items, the Options and Date format sections (displayed when Date/time is selected in the Type section) are not important because all the pertinent information is provided when the reference is added (see Adding and Modifying SharePoint References). However, if the custom field is used to index binary (unstructured) documents as well, refer to the procedure provided in Adding or Modifying Custom Fields. The custom fields from all sets appear in the in the SharePoint reference page.